Question: "How did Jesus fulfill the meanings of the Jewish feasts?" Answer: The way in which Jesus fulfilled the Jewish feasts is a fascinating study. In the Hebrew Scriptures, the Jewish prophet Amos records that God declared He would do nothing without first revealing it to His servants, the Prophets (Amos 3:7). From the Old Covenant to the New, Genesis to Revelation, God provides picture after picture of His entire plan for mankind and one of the most startling prophetic pictures is outlined for us in the Jewish Feasts of Leviticus 23. The Hebrew word for feasts (moadim) literally means "appointed times." God has carefully planned and orchestrated the timing and sequence of each of these seven feasts to reveal to us a special story. The seven annual feasts of Israel were spread over seven months of the Jewish calendar, at set times appointed by God. They are still celebrated by observant Jews today. But for both Jews and non-Jews who have placed their faith in Jesus, the Jewish Messiah, these special days demonstrate the work of redemption through God’s Son. The first four of the seven feasts occur during the springtime (Passover, Unleavened Bread, First Fruits, and Weeks) and they all have already been fulfilled by Christ in the New Testament. 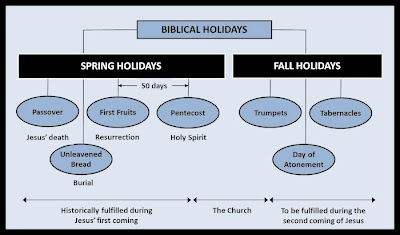 The final three holidays (Trumpets, The Day of Atonement, and Tabernacles) occur during the fall, all within a short fifteen-day period. 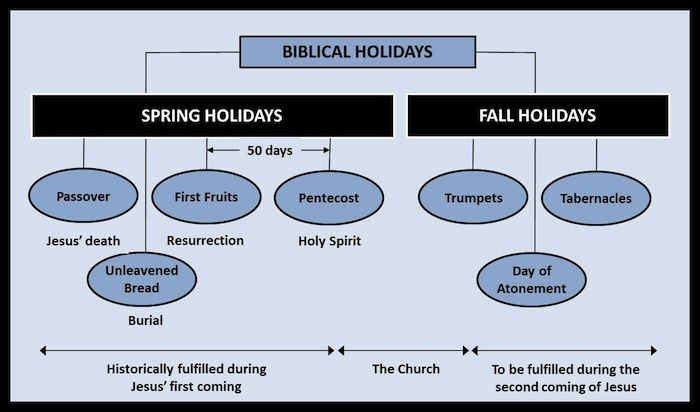 Many Bible scholars and commentators believe that these fall feasts have not yet been fulfilled by Jesus. However, the “blessed hope” (Titus 2:13) for all believers in Jesus Christ is that they most assuredly will. As the four spring feasts were fulfilled literally and right on the actual feast day in connection with Christ's first coming, these three fall feasts, it is believed by many, will likewise be fulfilled literally in connection to the Lord's second coming. 1) Passover (Leviticus 23:5) – Pointed to the Messiah as our Passover lamb (1 Corinthians 5:7) whose blood would be shed for our sins. Jesus was crucified on the day of preparation for the Passover at the same hour that the lambs were being slaughtered for the Passover meal that evening. 2) Unleavened Bread (Leviticus 23:6) – Pointed to the Messiah's sinless life (as leaven is a picture of sin in the Bible), making Him the perfect sacrifice for our sins. Jesus' body was in the grave during the first days of this feast, like a kernel of wheat planted and waiting to burst forth as the bread of life. 3) First Fruits (Leviticus 23:10) – Pointed to the Messiah's resurrection as the first fruits of the righteous. Jesus was resurrected on this very day, which is one of the reasons that Paul refers to him in I Corinthians 15:20 as the "first fruits from the dead." 4) Weeks or Pentecost (Leviticus 23:16) – Occurred fifty days after the beginning of the Feast of Unleavened Bread and pointed to the great harvest of souls and the gift of the Holy Spirit for both Jew and Gentile, who would be brought into the kingdom of God during the Church Age (see Acts 2). The Church was actually established on this day when God poured out His Holy Spirit and 3,000 Jews responded to Peter's great sermon and his first proclamation of the Gospel. 5) Trumpets (Leviticus 23:24) – The first of the fall feasts. Many believe this day points to the Rapture of the Church when the Messiah Jesus will appear in the heavens as He comes for His bride, the Church. The Rapture is always associated in Scripture with the blowing of a loud trumpet (I Thessalonians 4:13-18 and I Corinthians 15:52). 6) Day of Atonement (Leviticus 23:27) – Many believe this prophetically points to the day of the Second Coming of Jesus when He will return to earth. That will be the Day of Atonement for the Jewish remnant when they "look upon Him whom they have pierced," repent of their sins, and receive Him as their Messiah (Zechariah 12:10 and Romans 11:1-6, 25-36). 7) Tabernacles or Booths (Leviticus 23:34) – Many scholars believe that this feast day points to the Lord's promise that He will once again “tabernacle” with His people when He returns to reign over all the world (Micah 4:1-7). Should Christians celebrate these Levitical feast days of Israel today? Whether or not a Christian celebrates the Jewish feast days would be a matter of conscience for the individual Christian. Colossians 2:16-17 tells us “Therefore do not let anyone judge you by what you eat or drink, or with regard to a religious festival, a New Moon celebration or a Sabbath day. These are a shadow of the things that were to come; the reality, however, is found in Christ.” Christians are not bound to observe the Jewish feasts the way an Old Testament Jew was, but we should not criticize another believer who does or does not observe these special days and feasts (Romans 14:5). While it is not required for Christians to celebrate the Jewish feast days, it is beneficial to study them. Certainly it could be beneficial to celebrate these days if it leads one to a greater understanding and appreciation for Christ’s death and resurrection and the future promise of His coming. As Christians, if we choose to celebrate these special days, we should put Christ in the center of the celebration, as the One who came to fulfill the prophetic significance of each of them.